Is it the same event as a right click? Fixed in upcoming (0.5) version. as are all the NPEs due to pressing Ctrl-B in unappropriate places. ...), control-click to select a file. I think I can navigator to file according file name in javadoc comment,such as "index.jsp" file name in struts.action-forward tag. I think this is very convenient way,otherwise I need copy file name, press CtrlShiftN,past filename,and press Enter. Is it possible? >I think I can navigator to file according file name in javadoc comment,such as "index.jsp" file name in struts.action-forward tag. I think this is very convenient way,otherwise I need copy file name, press CtrlShiftN,past filename,and press Enter. Is it possible? path: where is the file located, relative to the module root? the file name in XDoclet tag is just a file name under project root path,and it is under module root directory,maybe deeply. We need to search this file under module root. For Struts webapp,if module root is "d:\source\myweb",and "index.jsp" may be "d:\source\myweb\index.jsp" or "d:\source\myweb\WEB-INF\webpages\index.jsp" and so on. I think the MiniWiki can search the destination files by file name. >..it is under module root directory,maybe deeply. We need to search this file under module root. For Struts webapp,if module root is "d:\source\myweb",and "index.jsp" may be "d:\source\myweb\index.jsp" or "d:\source\myweb\WEB-INF\webpages\index.jsp" and so on. 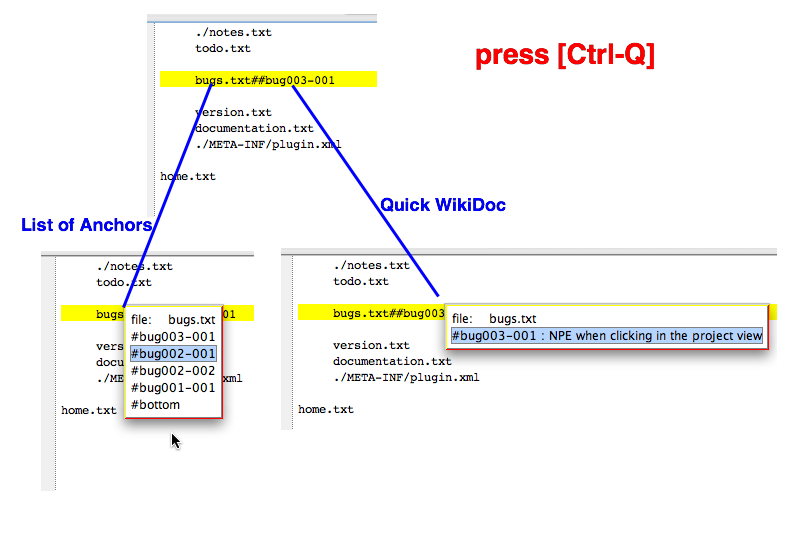 I think the MiniWiki can search the destination files by file name. leads to no file yet. >I wonder: are there other storage locations, configurable through IDEA's (web-app) settings? I think we cann't do it well. Some frameworks,such as Struts,Spring, path info are storaged in framework's configuration file.Getting some path info from framework configuration file is not very good solution. >I can modify the algorithm, when the target doesn't exist, to look for it under the project and module root. It's easy, and I'll add it in the next release. I think the format of file name,such as "//index.jsp" or "///index.jsp",is not important,because different frameworks need the special format. I think moduleRelative is very common,just beause web module type. I have one question about "CreateFileByIntention",and I think we can create file by choose some file templates by extention name,this is very essential. template, from the ones associated to the extension. I'll release this version in about a week. - Ctrl-B on url, email, ..
home, todo, done and bug files. cases, as you would use the MiniWiki only - mostly - in text and java files. Would be a good candidate on all platforms? ease that step for the user. I have one question about MiniWiki. After I install this plugin, I found some menu items became unvisible. If I remove this plugin,all the menu items are fine. I post a picture to describe this case. I have no idea about this question. >..After I install this plugin, I found some menu items became unvisible. settings: the labels are blank for those 2 actions. It's fixed in v0.5... patience..